San Diego, CA (USA) -- Buddha meets Benjamin Franklin in a unique fusion app that incorporates Franklin’s time-honored self-improvement system with Buddha’s Noble Eightfold Path – with an iPhone twist. 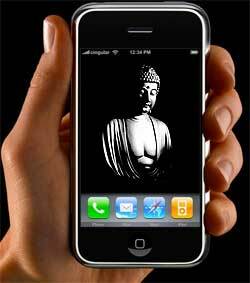 Equilibrium Enterprises has unveiled its latest iPhone application, Noble Paths, a unique fusion app that incorporates Franklin’s time-honored self-improvement system of daily tracking to enhance awareness and personal growth with the wisdom of Buddha’s Noble Eightfold Path. Noble Paths applies the same practical, methodical approach that Ben used to train his mind to refine his 13 Virtues through the exclusive focus upon one virtue for one week. One can only truly learn via experience and new opportunities. It is up to us to recognize these lessons and learn for ourselves. Noble Paths the app is a tool that can willfully assist each of us in our quest for such presence. Noble Paths helps us to recognize that it is ultimately each of these moments that shape our destiny. Noble Paths for the iPhone is available now at the App Store (www.apple.com/iphone/appstore) for $2.99. Coming soon: Noble Paths for Android and Noble Paths for BlackBerry devices.